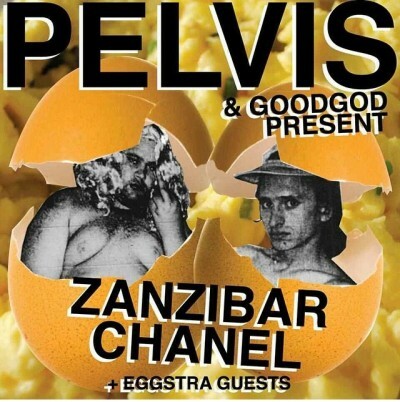 On Good Friday Eve, Poach Benedict is coming out of retirement for Goodgod’s full venue frypan, turning the club sunny side up with scrambled sounds to hard boil your brain. Whisky business in the backroom with Zanzibar-Chanel and Pelvis whilst Tennis Boys, Victoria Kim, Low Ton DJ’s and Jimmy Sing keep the front room fertile. Come down to the carton in your finest Fabergé and let your eggcup runneth ova. Red Bull Music Academy and Goodgod Small Club teamed up once again to present James Pants (USA)! Photos by Sam Ali for Backyard Opera. Noise In My Head and Goodgod present one night with the legendary Maurice Fulton for his first visit to Sydney in three years! 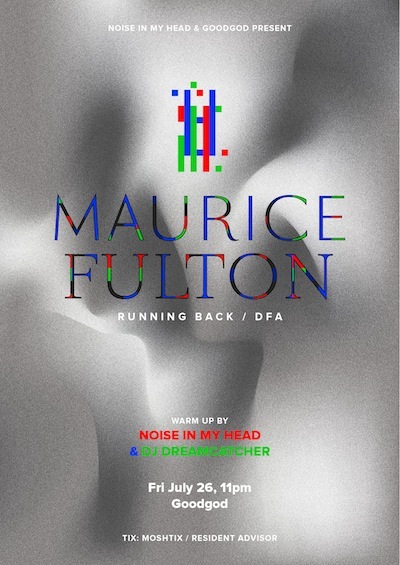 Maurice Fulton’s career has been as eclectic as it’s been essential, with 15 years of dancefloor-driven exploration that has seen him traverse house, garage disco, and leftfield techno. Through countless productions under his own name and numerous guises (Syclops, Eddie & The Eggs) and labels (DFA, Running Back), Fulton has pushed the rules of dance music time after time, earning himself a reputation as a master of manipulating the dancefloor. A maverick artist who prefers to let his music do the talking, Fulton’s club performances are the perfect way to enter his world – a deep, soulful distillation of his formidable career by way of his coveted collection of tunes. His last set in Sydney is the stuff of urban myth where he deejayed for 6 heavenly hours without one poor selection – so please, come prepared to DANCE! The legendary out-spoken Scotsman is in Australia for Golden Plains festival and wants to keep you Sydney rock-a-bye babies up all night! Keb Darge had been secretly collecting fifties Rockabilly, Surf, R&B, and ‘Tittyshakers’ for over 20 years before it clicked as the perfect way to get the girls grinning on the dance floor. 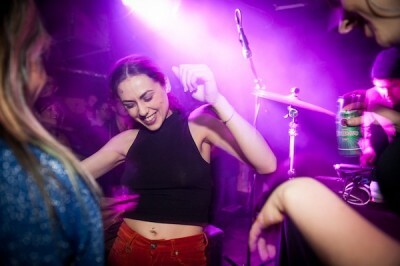 Not long after, Keb took the plunge and started a weekly Saturday night at Madame Jo Jo’s in London where this “fun” music would be the focus. And “BOOM” it was a whooping success - pure, honest, jiving music from the 1950’s! He has since done five compilations of the sound for BBE records which have become the label’s bestsellers, including one with Paul Weller and another with Cut Chemist, whom he converted to the rockabilly fever, with a sixth compilation due out mid this year. 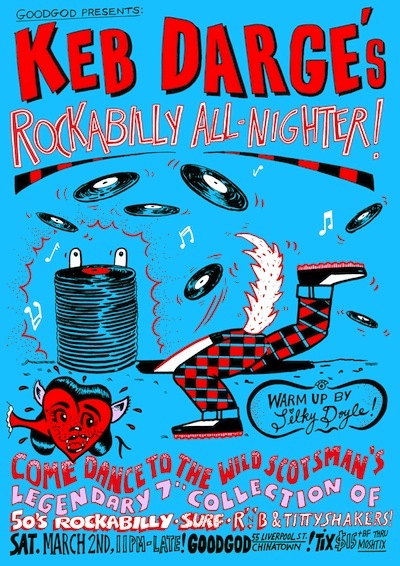 Don’t deny yourself the Keb Darge dance floor fever when he makes his very special Goodgod appearance!